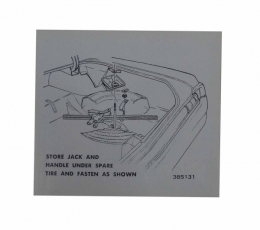 Spare tire & jack stowage instructions decal. Typically found on underside of trunk lid. Replaces original GM part #385131. Add that final touch to your restoration. Top quality, official GM reproduction, MADE IN THE USA.